Vacation package, flight, hotel and car to Northern Italy. Olympic Kosher Holydays, Half Board, Lemehadrin. A Fiat L500 or similar to the entire period. Hotel Olympic Kosher Holidays is a Kosher Lemehadrin 3 star hotel. 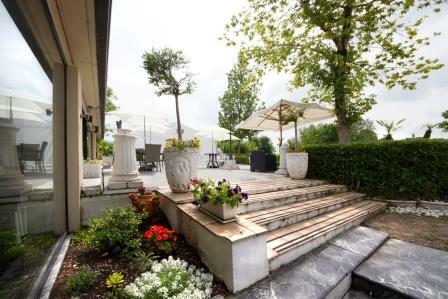 Located in a beautiful, pastoral and peaceful area surrounded with color, water and greenery, in south Lake Garda and a few meters from the picturesque beaches of Lugana Di Sirmione (the east quarter of Sirmione). 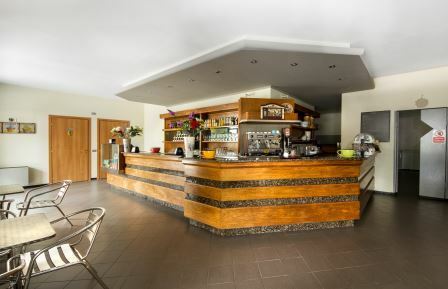 The hotel is located 6 km from the center of the old town of Sirmione (about 10 minute drive), on the road that connects Peschiera and Sirmione. The ideal location of the hotel allows you not only to enjoy a magical and serene vacation but also to travel and explore the breathtaking views of Italy, the fascinating history and the endless attractions of the North that can be enjoyed by families and on your own. The perfect combination of history, nature and high quality food (Kosher Lemehadrin) promises you the prefect vacation for your body and soul. The Hotel is open all the year. 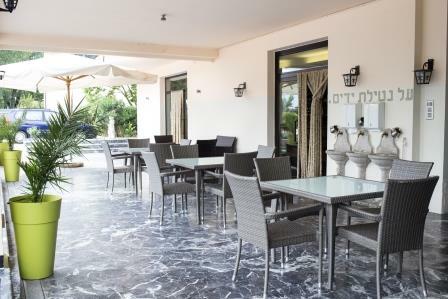 Olympic Kosher Holidays is a 3-stars kosher hotel, located in the south of Lake Garda just meters from the picturesque beaches of Logana di Sirmione. 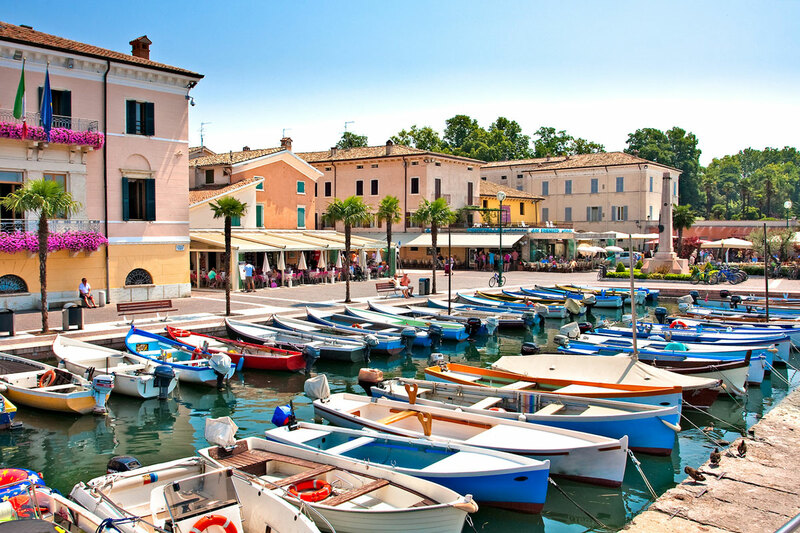 (The eastern part of the town of Sirmione) in a tranquil and pastoral area. Hotel Olympic Kosher Holidays is a Kosher Lemehadrin 3 stars hotel. Large gardens, greenery with seating areas and a playground for the children. Spacious meat restaurant with a rich menu. Pizzeria and coffee shop (dairy area) with local food such as pasta, pizza and ice cream, and also Israeli dishes such as falafel, hummus and a variety of salads. Grocery store with a big variety of kosher products of snacks, cakes, wine, fresh bread, challot, canned food, eggs, dairy and meat products and more. Large and spacious parking lot, free of charge. Free wireless connection in the hotel area. All of the kosher restaurant services – Coffee shop, Pizzeria and the Grocery store are available to guests who are passing by and not staying at the hotel. The kosher hotel can be used as a venue for private events as weddings, Bar and Bat Mitzvah, business meetings, events and other social events. There are 12 rooms in the kosher hotel, all of them well designed and accessorized. Most rooms have a balcony either facing the lake or the front garden of the hotel. All rooms have a shower, no bath. We can arrange a baby bath upon request. SIRMIONE is one of the most well-known villages in Italy and almost all tourists who visited the northern part of Italy have been there. 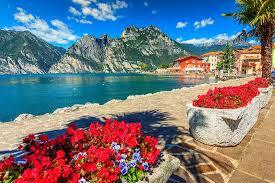 It is located on the south part of Lake Garda, the biggest and most beautiful lake in Italy. It is a big amusement to walk along the narrow and crowded lanes of the old town, open to pedestrian only, with plenty of tourist shops, coffee and ice-cream bars where to sit and enjoy the lake view. Thanks to its ideal position, plenty of one-day tours to many artistic Italian sites can be organized. Nature lovers will enjoy looking at the spectacular colors, sounds of the birds and flowing water over the Varona waterfall. Sigurta Park and Molina Nature Reserve are the places that the romantics will take their lovers or to Romeo and Juliet s balcony in Verona. They can walk in the vineyards along the River Hmintz’io Bfskiarh or in the evening enjoy a gondola ride in Venice. Families can enjoy the Natura Viva Zoo, go on a bicycle ride in the alleys of Brescia, sail on a boat in Lake Como. Children will love to go on fun rides in the different Amusement Parks – Gardaland , Movie Land and Canevaworld. Art lovers can visit the Museum of art in Milan, the Museum of the War of Italy in Solferino or the Ferrari Museum in Modena. Jewish investigators can trace the magnificent past of the communities that lived in Venice, Verona, Milan, Ferrara and Padua. Artists can find their magic in Florence, memorable Bologna and Bolzano with unique Austrian tradition. Of course let s not forget the shopping enthusiasts who can enjoy the Outlet Franciacorta, the Il Leone mall and Milan s Golden Triangle. The Kosher Lemehadrin restaurant is open also for guests who are not staying at the hotel. The restaurant offer rich dairy breakfasts and meaty lunch and dinner in the menu you can find Italian specialties and Israeli dishes, during Shabbat the restaurant serve more traditional Jewish meals in a Family atmosphere. Rich breakfast buffet that s include: Salads, milk, fresh bread, boiled eggs, omelets, yogurts, selection of cheeses, juices, tuna , selection of paste (honey, butter, jam, chocolate, etc. ), cereals, cakes, biscuits, toast, hot beverages (coffee and tea) and more. In lunch you can enjoy from our menu selection of first course, pasta, Soups, salads, fish and meat dishes with variety of side dish, fruit and deserts. Dinner included a rich buffet with selection of salads, pasta, fresh bread, soup, and variety of meat dishes, fish a selection of side dishes, fruit and deserts. At the hotel restaurant, we put emphasis not only on Shabbat meal, but also on the family atmosphere. We believe that the spiritual transcendence on Shabbat is combined with good food, Shabbat songs, Torah and festive atmosphere of home. Friday dinner and Shabbat lunch is served at rich buffet and included the best of traditional Shabbat meal like : wine, salads, appetizers, soup (friday dinner), a selection of meats, fishes, side dishes varied, cakes, fruit, desserts and hot drinks (coffee and tea). Friday night and Shabbat lunch reservation need to be booked and pay before Shabbat. Shabbat dinner usually is rich dairy buffet with fish and hot side dish, price for adult 30 EUR and child (2-12) 20 EUR. You can pre order vegetarian meals or any other diet required meal. The elegant dining room can accommodate up to 150 people, and is suitable for every kind of event, as birthdays, Bar and Bat Mitzvah, weddings, meetings, lectures and seminars. In case of small number of diners the restaurant reserves itself the right to serve food according to the menu and not as a buffet. EUR 40 per adult, EUR 30 per child. EUR 60 per adult, EUR 40 per child. EUR 35 per adult, EUR 25 per child. Verona 29 Km or 30 minutes drive. Bergamo 90 Km or 1 hour drive. Milan Malpensa 170 Km or 2 hours drive. Venice 150 Km or 1 hour and 45 minutes drive. Bus line number LN-026 to Verona reaches to the train station of Peschiera. The same bus to the opposite direction (Brescia) reaches to the train station of enzano. From there it is possible to reach the most important towns and cities in north of Italy, as: Venice, Verona, Milan, Bologna, Florence and more. 1. The internal line that reaches Colombare di Sirmione center from where you can take other bus that reaches the historic center of Sirmione. 2. Bus line LN-026 reaches either Verona or Brescia center (opposite directions) where you can change to other lines to a variety of destinations in northern Italy. This line also reaches the train station of Peschiera with several bus lines that connect to all of the parks around Lake Garda and many more destinations. From Milan Malpensa Airport, drive according to the signs in direction Milano-Varese and before Milan turn right to the A4 highway toward Venice. Exit at Sirmione, and continue toward Sirmione and when you join the coastal road turn left on direction Peschiera. The hotel is located on the left side of the road, at two km. from the center of Sirmione. From Bergamo airport, reach the highway A4 toward Venice, and follow the indications as above. From Verona and Venice airport follow the signs leading to the A4 highway toward Milan. Enter the highway and exit at Peschiera after a few km. Then continue toward Sirmione. You will find the hotel on the right side of the road, one km. after the sign indicating the beginning of Sirmione. - Verona -29 Km. or 30 minutes drive-. - Bergamo -90 Km. or 1 hour drive-. - Milan Malpensa -170 Km. or 2 hours drive-. - Venice -150 Km. or 1 hour and 45 minutes drive-. 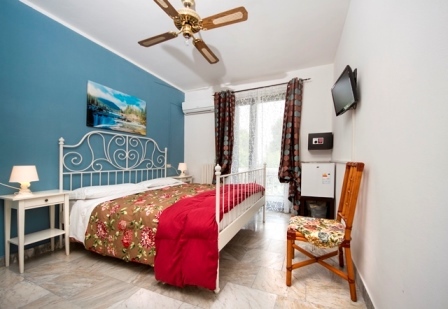 Price per person in a double room: EUR 980. 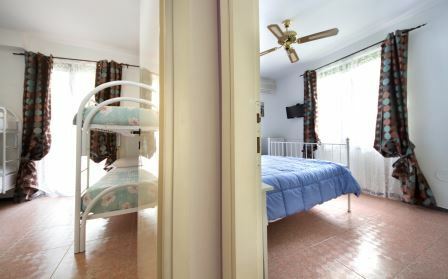 Price per person in a room for 4: EUR 890.